A total of 11 players are advancing to Day 3 in the $2,700 World Poker Finals Main Event. Play resumes on Monday at 11am, and will play down to a winner. For a list of results so far, please see this link. The flop comes ace high giving Dino a higher pair, and the turn and river were blanks, awarding Dino a double up. Sherwin Agard was just eliminated after shoving all in holding K♥J♦ and getting called by Matthew Wantman holding 7♥7♦. The board ran out all low cards and a queen. Wantman's sevens hold and Agard is eliminated from play in 15th place. There's nearly 50,000 in the middle and a board reading A♠Q♥3♠ when Staafan Lind shoves all in for around 150,000, and Frank Servidio snap-calls. "Did you say call?" Lind asks. Servidio confirms, and Lind turns over A♥3♣ for two pair. But unfortunately for Lind, Servidio has flopped a bigger two pair holding A♣Q♦. The 6♠ turn and 9♠ river do not change the hand and Lind is eliminated from pla. 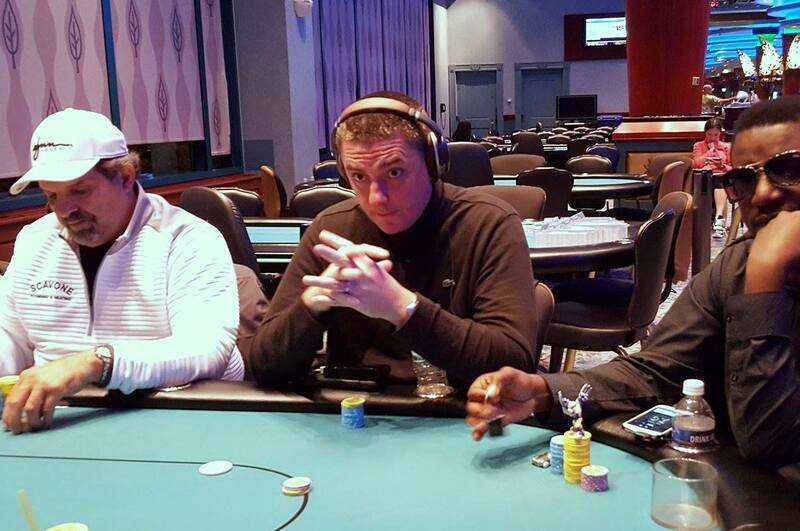 James Campbell shoves his remaining chips into the middle (totaling around 30,000), and Justin Adams raises in middle position. All remaining players fold. The board runs out king high giving Adams a pair of kings with an ace kicker, and Campbell is eliminated in 17th place. Facing an open from Jovy Ounthongdy in middle position, Michael Sanders shoves all in from the cutoff for around 140,000. 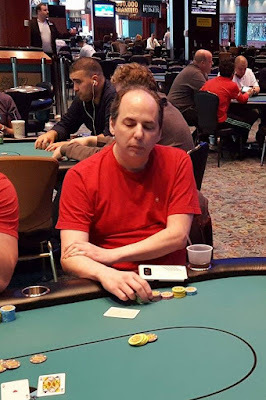 Carlo Sciannameo reshoves in the small blind, having both players covered, and Ounthongdy moves his remaining chips into the middle. The flop comes J♦9♣7♥ leaving Ounthongdy in the lead with his pair of kings, but that all changes when the turn comes the Q♣ giving Sciannameo a set of queens. The 2♦ river does not change the hand, and both Sanders and Ounthongdy are eliminated from play, while Sciannameo nearly triples up. The remaining 20 players are now on their last 15 minute break of the night. They will return to play two more levels before bagging and tagging for the night. 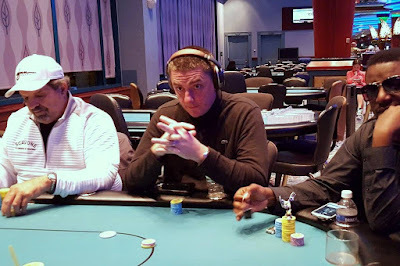 Laurie Hilton shoves all in for 38,000 in the cutoff, and Kevin McKenzie reshoves over the top for around 90,000 on the button, and Justin Adams calls in the big blind, having both players covered. The Q♣ appears in the window, but it's followed by the K♥ (and the 4♣). The 9♦ turn and 3♠ river do not change the hand. Hilton is eliminated from play in 22nd place, and McKenzie more than doubles up. There's nearly 200,000 in the middle and a board reading K♦7♠2♠J♠ when Ernie Hou bets out 50,000 from the big blind. With action on Staaffan Lind in the hijack, he announces that he is all in, having Hou covered. If Hou calls, it will be for his remaining 168,000, so as expected Hou goes deep into the tank. After nearly four full minutes Hou calls for a clock. The floor approaches and Hou says he called the clock on himself and the floor says, "Oh, ok. You have a minute to act or your hand will be declared dead." The floor starts counting down the last ten seconds and Hou announces a call, turning over A♥A♣. Lind is visibly shocked as he turns over K♠Q♥ for a pair of kings. The 8♠ river does not change the hand and Hou is awarded a huge double up. "I'm sorry," Hou says very genuinely, "It was a very difficult call for me." Facing an open from Matthew Wantman in later position, Ryan Chua shoves all in for around 60,000 on the button. Justin Adams reshoves having all players covered, and Wantman mucks. The board runs out nine high, and Chau is eliminated in 25th place, as the official bubble. All remaining players are now in the money. The remaining 25 players are now hand for hand until the money bubble breaks. All players making the money are guaranteed at least $6,850, with first place taking home $133,177. Full payout and prizepool information can be found by clicking this link. Ernie Hou raises to 11,000 in early position and Carlo Sciannameo shoves all in for 49,500 on the button. Sherwin Agard calls in the big blind, and Hou opts to fold. Sciannameo turns over A♦J♥ and upon seeing Agard's A♥K♥ he says, "Of course." The General who is standing near the rail says to Sciannameo, "It's ok, jack on the flop, Merry Christmas!" The flop comes J♠6♦3♠ giving Sciannameo the lead with a pair of jacks. "Merrryyyyy Christmas," the General says as he hugs Sciannameo. "Where's my king?" Agard asks the dealer. But the 8♥ turn and 9♣ river do not improve his hand, and Sciannameo doubles up. We are down to the final 27 players in Event #20. As a reminder, 24 players will make the money. We will bring you a list of all players with chip counts in just a few minutes after they get their new seat assignments. There are currently 30 players remaining (with 24 getting paid) as they head to a 60 minute dinner break. The players will return to play Level 17 with 2,500/5,000 blinds and a 500 ante. The average stack will be 226,000 upon return from the break. JeWook Oh is the current chip leader with over 600,000. Justin Adams and Matthew Wantman trail just behind Oh in the high 500s. Jeremy Meacham also has a big stack in the mid 500s. They will redraw when they reach 27 players, and then go hand for hand shortly thereafter. We will bring you an account of all of the action as it unfolds after the dinner break. For a full look at the payouts please click this link. Kurt Lichtman shoves all in for around 70,000 in the hijack and Jeremy Meacham calls in the big blind. The flop comes A♠5♥5♣, giving Meacham the lead with a pair of aces. The 10♦ turn and K♥ river do not improve Lichtman's hand and he is eliminated from play within ten from the money. Sallie Stohler shoves all in for around 35,000 on the button and JeWook Oh calls in the big blind. Oh Wishes Stohler good luck before the hands are tabled. 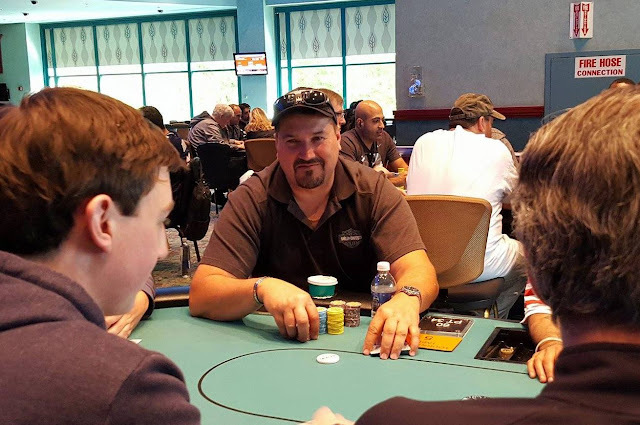 The flop comes eight high giving Stohler a pair of eights. The turn is a blank, but the J♣ on the river gives Oh a higher pair, and Stohler is eliminated from play. Jeremy Meacham just sent James Wilsey home after flopping a pair of queens against Wilsey's A♥10♥ on a Q♣J♥9♦ board, and turning two pair when the 2♣ turn hit. (Meacham held Q♠2♠). The 10♠ river did not improve Wilsey's hand and he is eliminated from play. Meacham is now sitting with just over 310,000. There were a total of 142 players in today's Event #22 ($300 NLH Big Stack) Event, generating a prizepool of $35,813. $2,700 Main - Ernie Hou "Has Tim Reilly's Number"
There's 25,000 in the pot and a board reading K♠K♦3♠ when Tim Reilly bets 6,000 in middle position. Ernie Hou raises to 13,000 in the cutoff, and Reilly calls. The turn is the 8♠. Reilly checks and Hou bets 20,000. "You know what? You've had my number all day, I'm just gonna fold," Reilly says as he tosses his cards into the muck. "You are right, I have had your number. You are the much better player," Hou says to Reilly. Reilly looks over at Hou, and Hou says, "I am being serious, you are a much better player, I just am catching great cards," and the players move on to the next hand. Players are now starting Level 15 with 1,500/3,000 blinds and a 500 ante. The clock says there are 46 players remaining (24 will make the money), and the average chip stack is 147,391. Just shortly before the break, a hand that extended into the break took place between JeWook Oh and Sherwin Agard. 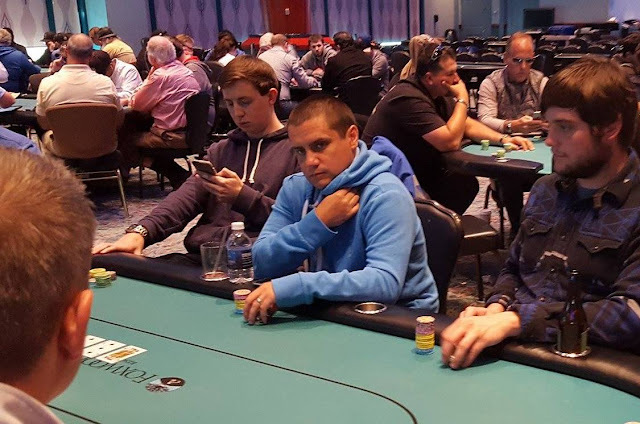 With around 80,000 in the middle and a board reading 10♥5♥4♣8♦7♥ Sherwin Agard bet 15,000 in the big blind and JeWook Oh paused for nearly 30 seconds before raising to 50,500 in the cutoff. Agard talked to himself (and to the live stream camera) for nearly two minutes saying things like, "If I fold this hand, I'm going to win the tournament. I am the great one." Eventually he folded. "I'll show one time," Oh said as he turned over A♠5♠ for a pair of fives and the players headed to break. Zach Schwartz raises to 5,300 in the hijack and David Stefanski shoves all in for around 43,000 on the button. It folds back to Schwartz who tosses in a chip to call. The board runs out 9♠5♣2♣2♥4♥. Schwartz's queens will hold, and Stefanski is eliminated from play. Allen Kessler was recently left short after shoving all in with AK and running into aces. Frank Servidio raises to 5,000 in the cutoff and Allen Kessler moves his remaining 1,800 in chips into the middle from the small blind. Ryan Mostafa calls in the big blind. "I check dark," Mostafa says right before the 9♦8♦6♠ flop is dealt. Servidio checks as well. The two players also both check the 5♠ turn. The river is the 10♣. Mostafa grabs chips and moves them forward to bet, and Servidio quickly folds. Mostafa turns over 10♥5♣ and Kessler says, "I had you crushed," as he turns over A♥9♣. Kessler then turns to Servidio and says, "All you had to do was bet the flop." Servidio responds, "But I didn't have you beat." Another player at the table chimed in, "He probably wasn't going anywhere with the straight draw." So far, there are 126 entries in today's $300 No-Limit Hold'em Big Stack w/ Re-Entries tournament. The clock says that there are 93 players remaining, but registration is open for this event until the start of Level 11. The avg. stack at the moment is 40,645. Please see below for a summary of this event as well as notable chip counts in the field. Right before the break Brad St. Vincent took down a nice pot. St. Vincent had raised to 3,400 in middle position and the cutoff three- bet to 10,500. St. Vincent called. The flop came K♣4♥5♥ St. Vincent checked, the cutoff bet 9,000, and St. Vincent called. The turn was the 2♦ and this time St. Vincent check called a bet of 27,000. The river was the A♦. St. Vincent checked a third time, his opponent bet 50,000, and St. Vincent called. The cutoff showed 7♠6♠ for a missed straight draw. St. Vincent turned over 9♦9♥ to take the pot. It's time for the first 15 minute break of the day. The remaining 64 players will return to play Level 13 with 1,000/2,000 blinds and a 300 ante. We will bring you a list of chip counts upon return of the break. There's nearly 90,000 in the middle and a board reading K♥6♥2♦. Ryan Mostafa checks in the hijack and Matthew 'Bucky' Wantman bets 32,000 in the cutoff. Mostafa calls. The turn is the 4♣. Mostafa checks again and Wantman moves his remaining chips foward, having Mostafa covered. Mostafa sighs, starts counting out his chips, and after a minute and a half mucks his cards. A player in middle position raises to 3,600. Michael Sanders calls in the cutoff, as do David Johnston in the small blind and Carlo Sciannameo in the big blind. The flop comes Q♥7♠2♠. Both blinds check and the original raiser bets 9,500. Sanders raises to 22,000, and with action back on Johnston in the small blind, he pauses for a few moments before moving his stack of chips forward, shoving all in for around 67,000. Sciannameo folds his big blind, the original raiser thinks for 30 second and hesitantly folds, and Sanders asks for a count. As the dealer starts breaking down Johnston's chips, Sanders announces a call. Johnston is in the lead only until the turn comes the 4♠ giving Sanders the flush. The river is the A♠ and Johnston is eliminated from play. According to the table, high stakes poker pro Galen Hall was just eliminated by Sherwin Agard. Hall held A♠Q♥ against Agard's 10♣10♦. Agard turned a straight on a 8♦7♠6♠9♥K♦ board and Hall was eliminated from play. Gerry Aiello shoves all in from middle position for around 50,000. Action folds to Bob Allain in the small blind who pauses, sighs and moves his remaining 60,000 out in front of him. Samantha Cohen who was left very short the previous hand, tosses in her remaining 100 chip. The flop comes K♥5♣3♠ and Allain says genuinely, "Come one, give her another three." But the 2♥ turn and 7♦ river do not help Cohen or Aiello and they are both eliminated from play. 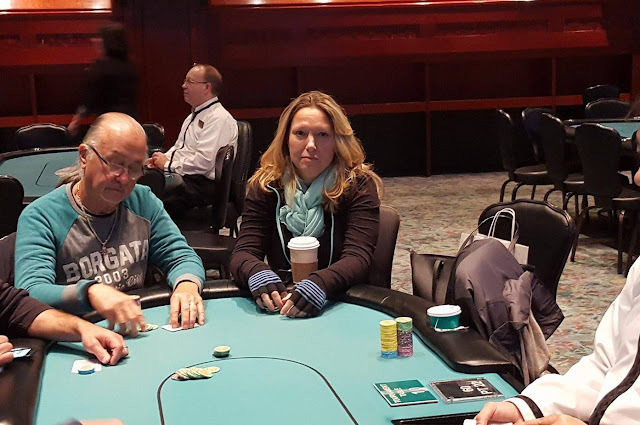 Samantha Cohen shoves all in from under the gun for around 23,500 and Jeffrey Saunders reshoves for around the same size stack in middle position. All remaining players fold. The board runs out6♦5♠4♦9♠7♦ awarding Saunders the pot with his ace queen high. After a close count of chips, Cohen is left with only 1,500 in chips (just over one big blind). The numbers are in and the prizepool for the $2,700 Main Event totals $548,050. The final 84 players have taken their seats and it's time to shuffle up and deal. Registration is now officially closed and we will bring you the prizepool information as soon as it's available. A total of 84 players are advancing to Day 2 in the $2,700 World Poker Finals Main Event (27 players from Flight A and 57 from Flight B). Play resumes on Sunday at 11am. Players are allowed to enter up until the start of Day 2 play, so the prizepool will be posted after registration closes. 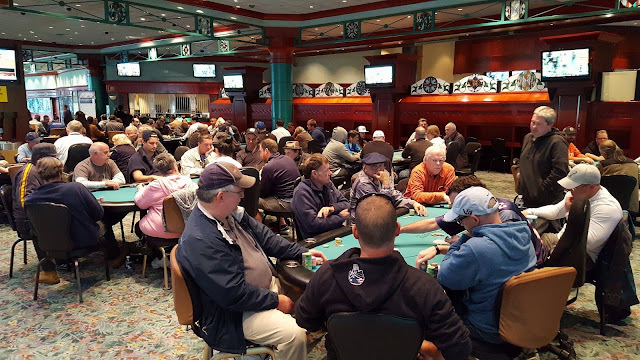 A total of 57 players are advancing to Day 2 from Flight B of the $2,700 Main Event. They will join the other 27 players that bagged in Flight A, and play Day 2 on Sunday at 11am. Because players are allowed to enter up until the start of play on Day 2, the prizepool has not yet been calculated,. We will post as soon as it's available sometime after 11am on Sunday.